A pattern is a small section of music. It is composed of 1 or more beats. 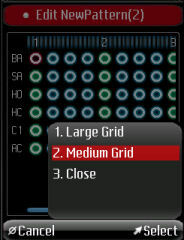 Usually 4 or 6 beats are enough for a pattern. Each beat is made up of 4 steps. Each step can be silent, or play drum instrument(s). Below is a screen shot of a pattern with the steps in blue, the step on a beat in green. The filled in circles are where a note is struck. A song is composed of a list of pattern numbers, also referred to as a play order. In this way a large song can be composed of a large sequence of only a few patterns, as shown below. The way in which the drum box application implements the principle of pattern based sequencing on the phone is explained by describing the screens and options that make up the drum box application. 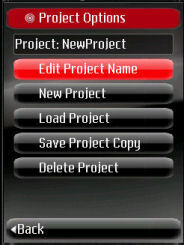 To exit a screen the application displays "Back" for an option screen, and "Close" or "Cancel" for all other screens. Selecting close exits the screen, all changes made are saved. Cancel on a popup menu, closes the menu, the screen stays the same. Cancel on a screen exits the screen without saving changes. For touch screens the interface is intuitive: tapping on an option or button activates it. Scrolling on touch screens is achieved by dragging the finger on the content area that needs to be scrolled. Typically only lists and the pattern editor need to be scrolled. A list scrolled by dragging the finger over the center of the screen from bottom to top. 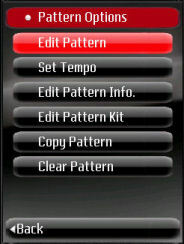 A pattern editor session scrolled by dragging the finger over the center of the screen from right to left. 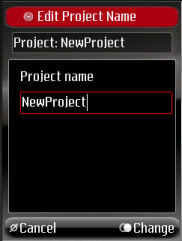 Editing of text is achieved by tapping on the field in question. This opens up the phone's native text editor. 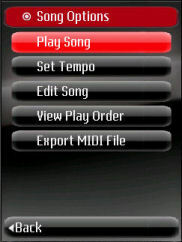 The drum box application supports touch screen and keypad use. For keypads, a section is devoted to their use. The use of the keypad is also intuitive, for completeness, there is a section devoted to its use. Click here to view it. 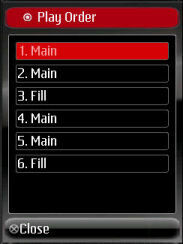 On keypad based phones, the application makes use of the game pad, shown below. 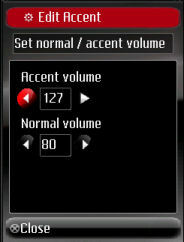 For the menu that appears at the bottom of the screen, the "Select" buttons on the phone are used, as shown below.